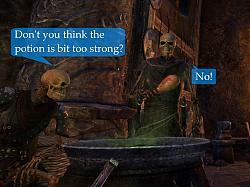 Includes crafting poison for DLC "Dark Brotherhood"
Since 4.0.0: UI re-design (smaller) Using symbols with tool-tips. Since 4.5: Full integration to alchemy station. If you want to provide a translation for a language not included yet or needs updated, feel free to do that. The only important thing for the translation of the trait names is: They must be written as shown in-game. Even if bad translated or having typos. - Move settings to account-wide. To create a favorite you setup a filter and search for potions. 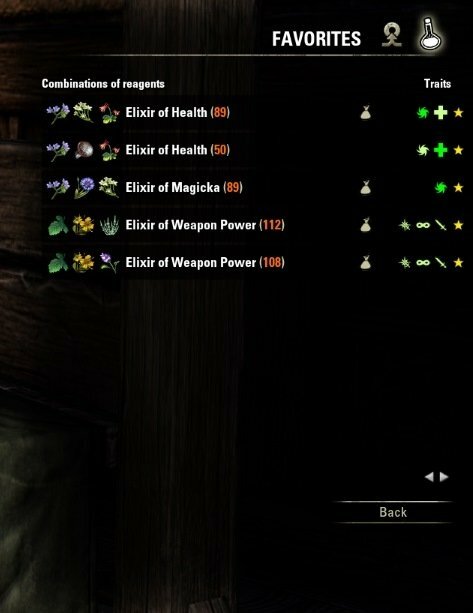 Once you have found a potion with the traits you need, click the result row. There is a button to mark this potion as favorite. Next time you open Potion Maker you don't need to setup the filter again and just click on "Favorites". 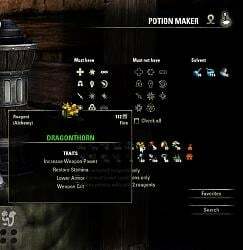 It depends on your addon-settings, if alternative combinations, which result in the same potion, are additional offered or not. The alternatives have a different colored "star". 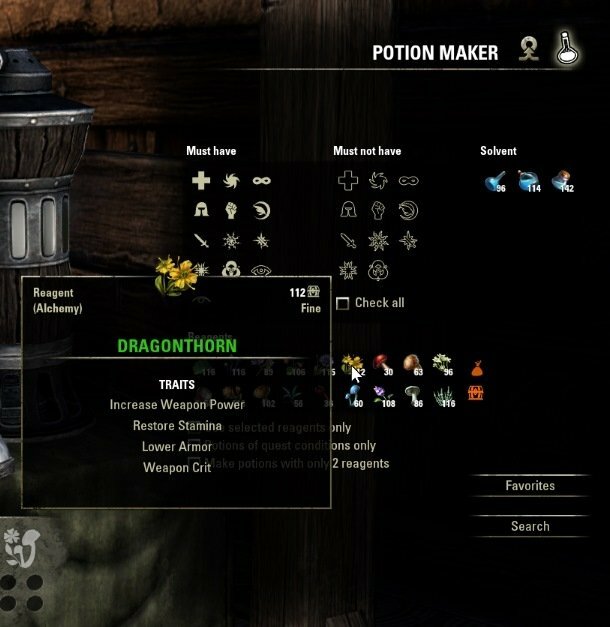 Potion Maker allows you to search for potions to make. It can also be setup to help you discover new traits. 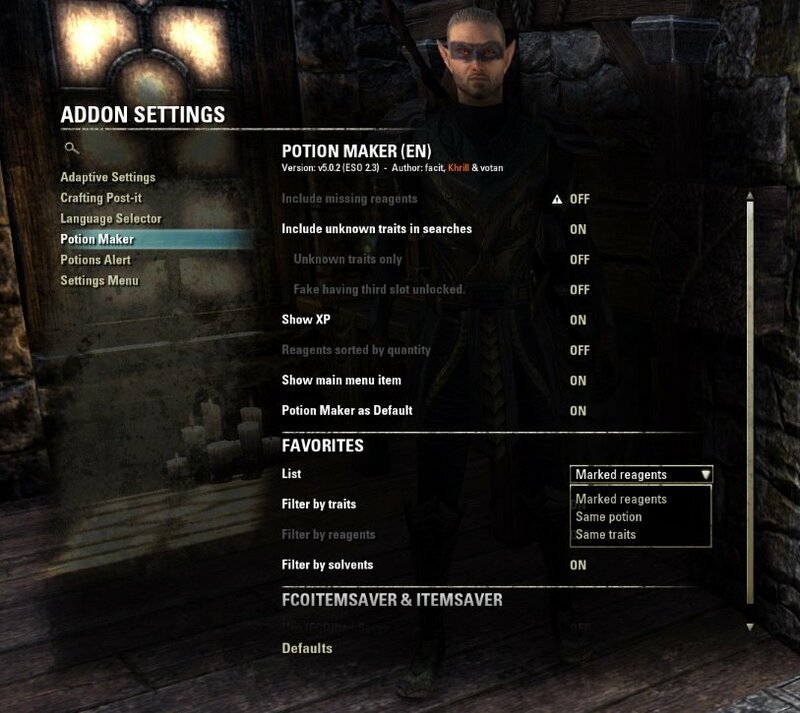 Potion Maker looks through your available ingredients and uses your chosen filters, to make a comprehensive list of all the potions you could make with those traits, using the reagents you have. 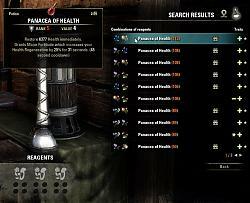 This list is shown in a window and you can click on a potion to add the ingredients to the alchemy table. If you use Potion Maker away from a alchemy table you instead get more information about the clicked potion. To use Potion Maker, simply use an alchemy table. Or you can type /potionmaker anywhere to bring it up. If you have suggestions or find a bug, please don't hesitate to report it. And feel free to contact me directly here on ESOUI or on Twitter @phazeet. Potion Maker vous aide à créer les potions dont vous avez besoin. Il vous permet de rechercher toutes les potions que vous pourrez préparer. 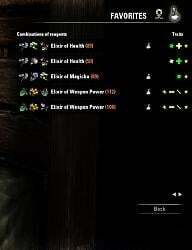 Il peut également être configuré pour vous aider à découvrir de nouveaux traits. Potion Maker prend en compte les ingrédients alchimiques de votre inventaire et en utilisant les filtres sélectionnés vous fournit une liste complète de toutes les potions que vous pouvez créer. Cette liste est affichée dans une fenêtre à part. Vous pourrez sélectionner une potion pour y ajouter, automatiquement les ingrédients, à la table d'alchimie. Si vous utilisez Potion Maker loin d'une table d'alchimie, vous obtiendrez à la place, plus d'informations sur la potion sélectionnée. Pour utiliser Potion Maker, il suffit d'utiliser une table d'alchimie. Vous pouvez, aussi utilisez la commande /potionmaker ,n'importe où, afin d'avoir accès aux fonctionnalités tierces de l'add-on. Si vous avez des suggestions ou si vous rencontrez un bug, s'il vous plaît n'hésitez pas à le signaler. N'hésitez pas à me (@facit) contacter directement ici sur ESOUI ou sur Twitter @phazeet (Je tweet en anglais et en suédois parfois). Un grand merci à Khrill pour son travail sur l'addon! Khrill a écrit toute la version 3.0.0. Son code est utilisé avec sa permission explicite. Many thanks to @Chou for the translation. Potion Maker hilft Dir die Zaubertränke zu erstellen, die Du haben willst. Potion Maker erlaubt es Dir nach Zaubertränken zu suchen. Außerdem can es so eingestellt werden, dass es Dir hilft nach neuen Eigenschaften zu suchen. Potion Maker durchsucht Dein Inventar nach Reagenzien und verwendete Deine Filtereinstellung um eine vollständige Liste der Zaubertränke mit den gewünschten Eigenschaften anzuzeigen, die erstellt werden können. Die Liste wird in einem Fenster angezeigt und durch klicken auf ein Zaubertrank werden die Reagenzien dem Alchemietisch hinzugefügt. Um Potion Maker zu benutzen verwende einfach ein Alchemietisch. Oder gebe /potionmaker oder verwende den neuen Menüpunkt oder definiere Dir eine Tastenbelegung um Potion Maker jederzeit zu aktivieren. Potion Maker поможет вам сделать зелья, которые вы хотите. Potion Maker позволяет воспользовать поиском для того, чтобы найти все зелья, которые вы можете изготовить. Он также может быть настроен таким образом, чтобы помочь вам открыть неизвестные свойства реагентов. Potion Maker сканирует ваш инвентарь на наличие алхимических реагентов и, используя выбранные вами фильтры, создаёт полный список всех зелий с заданными свойствами, которые вы можете создать из имеющихся у вас реагентов. Если вы используете Potion Maker вне алхимического стола, вы можете получить больше информации о выбранном зелье. Чтобы запустить Potion Maker просто воспользуйтесь алхимическим столом или наберите в чате команду /potionmaker - это откроет окно аддона. Если у вас есть предложения или вы нашли ошибку, пожалуйста, не стесняйтесь сообщить об этом. И не стесняйтесь связаться со мной напрямую здесь на ESOUI или на Twitter @phazeet (Я пишу твитты на английском и иногда на шведском). Огромное спасибо Khrill за проделанную им работу на аддоном! Khrill написал всю версию 3.0.0. Его код используется с его разрешения. Potion Maker te ayuda a elaborar las pociones que quieras. Te permite buscar las pociones que quieres elaborar. Se puede configurar para ayudarte a descubrir nuevas propiedades. Potion Maker examina los ingredientes que tienes en tu posesión y aplica los filtros que elijas para darte una lista exhaustiva de todas las pociones que puedes hacer con unas propiedades determinadas, usando los reagentes que tienes. Esa lista se muestra en una ventana y con un clic en una poción añadirás los ingredientes necesarios al laboratorio de alquimia. Si utilizas Potion Maker fuera del laboratorio de alquimia, recibirás información acerca de la poción en cuestión. 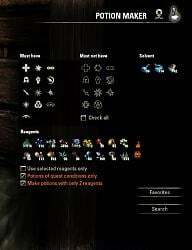 Para utilizar Potion Maker, basta con ir a un laboratorio de alquimia. O teclear /potionmaker en cualquier lugar para mostrar la ventana. Si encuentras un bug o tienes comentarios, no dudes en comunicarlo. Me puedes contactar directamente por aquí, en ESOUI, o en Twitter @phazeet. ¡Muchas gracias a Khrill por su gran trabajo con el addon! Khrill es el autor de la versión 3.0.0. Se utiliza su código con su autorización explícita. Including feature requests from QuadroTony and Xirael. Remarks: Potion Maker Extended or Potion Maker? Basically both add-ons do the same: Finding potions for you. See this redundance as some kind of backup. 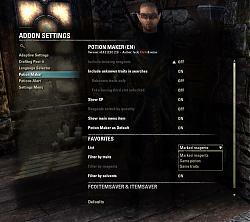 Potion Maker Extended uses checkboxes with always visible text (wide screen). Potion Maker uses symbols with tool-tips (small screen). In Potion Maker Extended you have to always type text to find potions of alchemist writs. In Potion Maker you have a single click option for alchemist writs, only. In Potion Maker Extended you can type any text to filter potions by name. In Potion Maker you can manage "Favorites". Potion Maker Extended has more desktop app style. 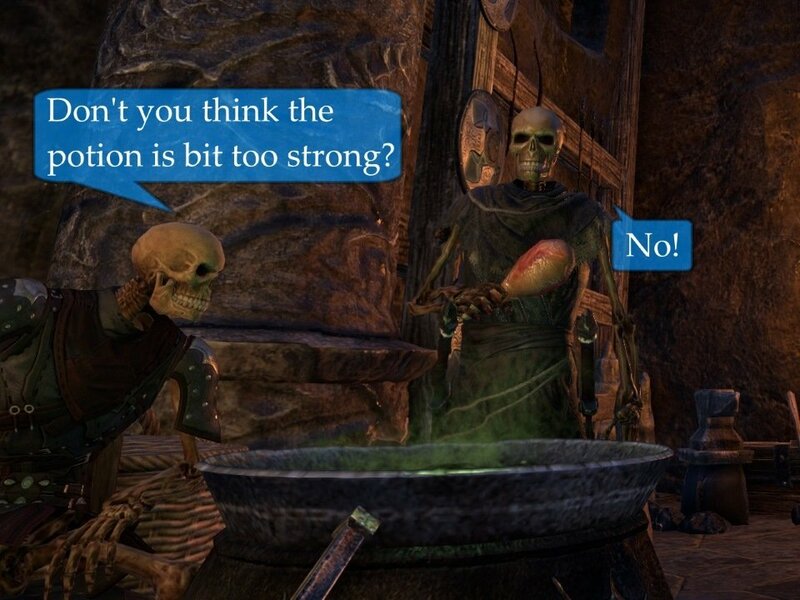 Potion Maker has more ESO style. It is up to your perferences, which version fits better to you. - New: Polish translation. Thanks to @tomkolp. - Replaced "Quest" checkbox with a button. As requested by @Omenpapa. - Fixed changing title, even if not selected. - Optimized UI creation a bit. - Fixed French writ quests after ZOS updated localization. - New poison art made by @manavortex. Thank you! - Update to LAM rev26. - "Clear Selection" button as requested. - Update Russian translation. Thanks to @KiriX. - Update Japanese translation. Thanks to @Marify. - Allow to include/exclude all kind of traits. - Update to LibAsync rev. 1.6. - Russian language update. Thanks to @TERAB1T. - Update to LibCustomMenu rev. 6.3. - Split settings into account-wide and player-specific. - Little fix for Chinese writ quest search. Thanks to rockingdice. - Another issue with French translation. - Added Chinese translation. Thanks to rockingdice. - Fixed French writ quest search. Thanks to Bayerithe and Ayantir. - Added "Select" and "Favorite" to context menu. - Hopefully fixed nil-error reported by BigM. - Update to LibCustomMenu rev.5. - Fixed German poison writs. 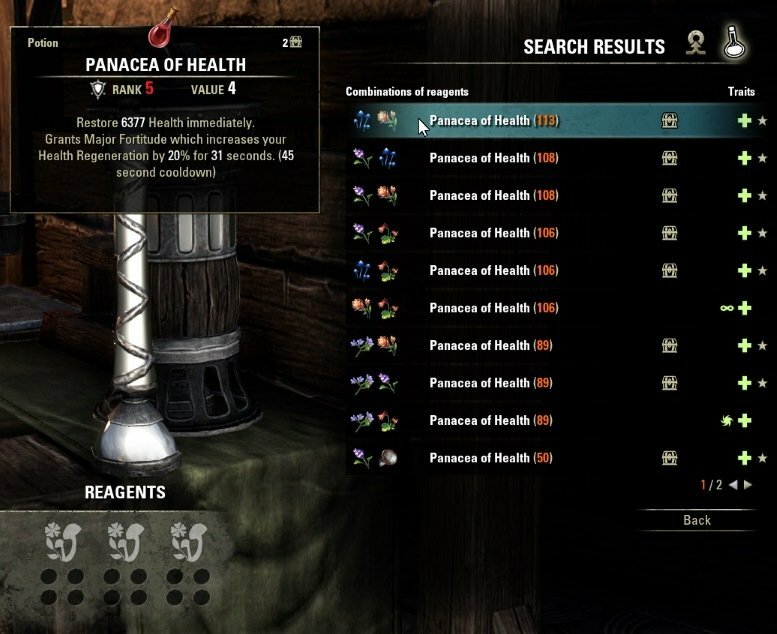 - Fixed "Use Missing Reagents" not working as expected. - Update to LibCustomMenu 4.3. - Update to french localization. Thanks to @lexo1000. - Localization: Updated Russian translation, including trait names. Thanks to @Memoraike. - Fixed bag/bank indicator, which had a problem with the ESO+ bank space. - Fixed English Master Writs (Hopefully): Hyphen in name. - Update to LibASync 1.3: Async table sort function. Sorting 8000+ potion names will not create short frame freeze. 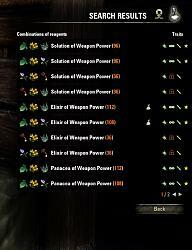 - Thankfully ZOS fixed the issue with the item names. So, the change from last version is reverted again. - Fixed bug, that the stand-alone Potion Maker scene was empty, if the last selected tab was for furniture. - Fix for writ quests in English. - Update for FCO ItemSaver. Thanks to @Beartram for writing the code for me. - Update to LibAsync 1.2. - Update libAlchemyStation to rev3.1: Remove legacy code to work with MultiCraft v10. - ESO 2.7 "Homestead" ready. - Update to LibAlchemy rev 3 for "Homestead". - New trait names for "Homestead". - Update to LibCustomMenu 4.2. - Remember solvent selection on tab switch. - Changed the tooltip control used for reagents to show information of other addons. - Renamed reagent trait names. - Made checkbox labels clickable. - Update to LAM2 rev 22. - Fixed french trait name translation. "Invisible", "Detection" and "Vitality" were shown as unknown traits in french. - Japanese language support. Thanks to Lionas! I want only say thank you to all the people who worked on this addon. I personaly use it since release (a long time ago) and it works like before. The new button I like very much, its so easy and learning unknown items also so easy. Is there an addon that just shows all the potions you can craft, then tell me what I need to craft them? IE Craftstore just says the Name of the finished Glyph, which I go and get matts for then craft. I sell everything I get, so I don't have a stash of matts (but do have a stash of gold). This add doesn't show anything is craftable, probably because I have no matts. 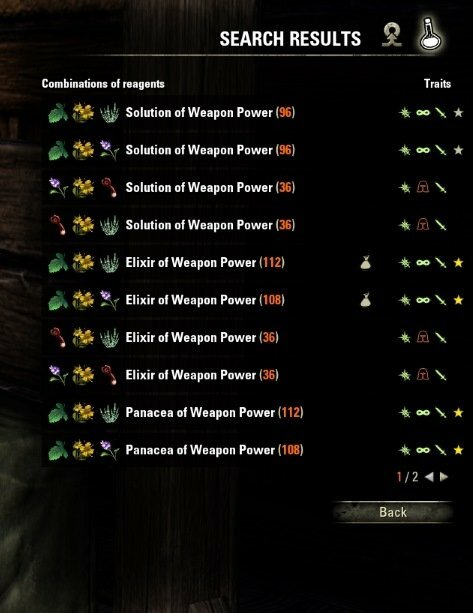 Is there an option to just show "Potion X" can use "A,B,C,D,E,F" to create? first: check if "include unknown traits in search" is enabled in the AddOns settings. Hover over the single reagents with your mouse. 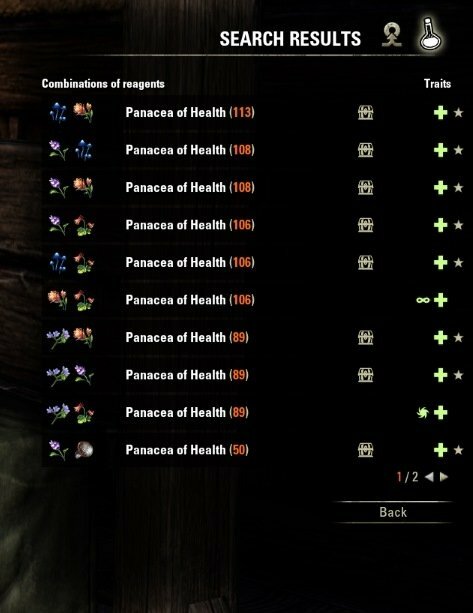 Klick one or two of these who have undiscovered traits (these are the reagents you have to buy from the store or collect). Then click search. Browse the list to find unknown results. Choose one and create it. Because you now learned a new receipe you have to refresh the list. Do not simple choose the next unknown result. Click back and start from beginning. Don't forget doing the same for the poisons. In addition: Use "Unknown traits only". Look for combinations with two locks first. Learn all traits. Turn both options off again and done. Last edited by TNTKokser : 04/10/19 at 05:15 PM. 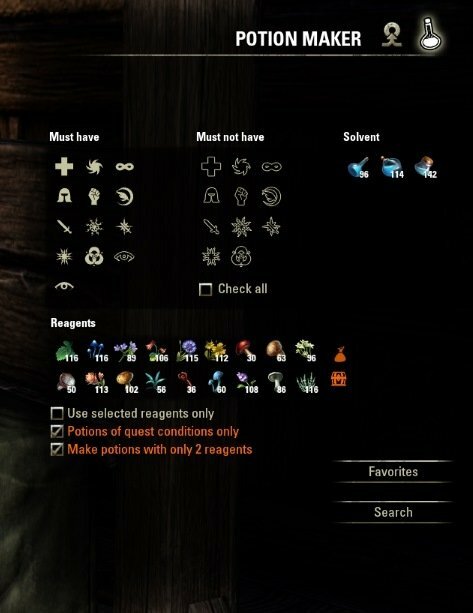 What about using the reagent filter to find potions using a reagent?? When I load into the game and check add-ons it says that I have a dependency error and am missing library LibAlchemyStation. I've been searching around this site and haven't found that library anywhere. Is it under a different name? I was able to find all of the other libraries that I was missing just fine. EDIT: I saw the library is included in the package. I don't know why the client didn't find it but I copied the library file into my live/addons folder and its up and running. Last edited by BobotheClown : 03/22/19 at 05:48 PM. "Potions of quest conditions only"
"make potions with only 2 reagents"
This way I wouldn't have to tick those in each time I'm using the addon. Alternatively an option to autocraft the quest potions/poisons when I open the alchemy tab at a crafting table would be even better. Great addon btw, thank you for your work! Yes, I can do something. May not on the next release, but a patch afterwards. Because the next game update gets closer. any chance of adding an option for crafting quantity? Adding this was never necessary, because MultiCraft (https://www.esoui.com/downloads/info...ft-AndAll.html) did all the job. Even for other crafting stations. keep up the great work, your addons are very much appreciated. If you like my work and want to see more of it, you can make sure I can do more by donating. It also helps as moral support for me, as I see that people care enough to give me some of their money.